Sire: Wlkabout Ima Larakin - "Kinta"
Dam: CH. Sasin Northn Whisper - "Whisper"
Socks did not meet our expectations and now has been re-homed. Socks is a fun loving full of bounce girl! Loves everyone she meets and thinks food is the greatest invention. Toys are a world of fun in her eyes. 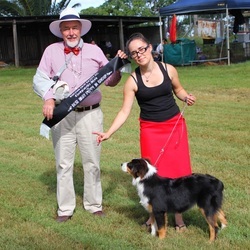 Socks goes Puppy in Group under judge Mr K Hammond (NSW) at the Hunter Kennel Club.